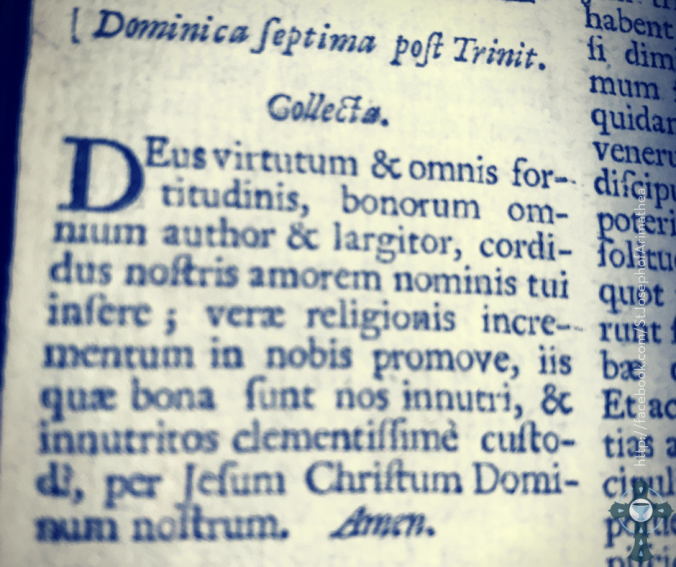 The Collect for Seventh Sunday after Trinity, Book of Common Prayer 1662, from Liturgia Seu Liber Precum Communium, 1696. The sermon audio begins at 4:29. 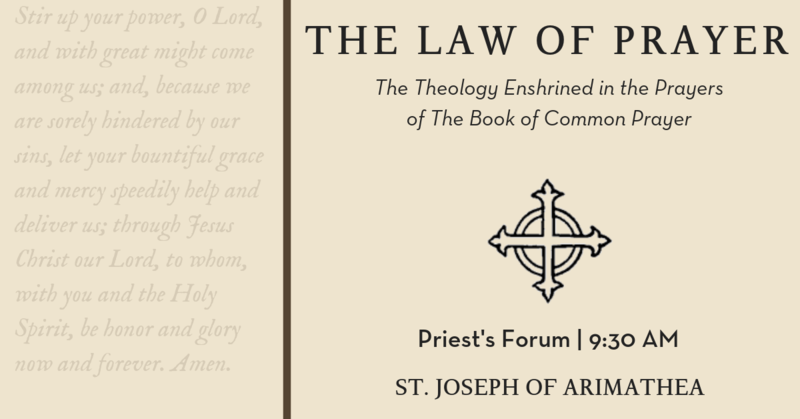 Today we hear from the epistle of James in our second lesson. You may already be aware that this letter is one of those New Testament texts that has taken a steady amount of criticism over the centuries, with some folks even questioning its presence in the canon. Mostly these criticisms have not arisen from questions of authorship, which in comparison with some other texts of the New Testament, is relatively clear. The main arguments being whether the letter is the result of teachings collected by disciples after his death, or the direct work of James the Just of Jerusalem–a brother or other close relative of Jesus, and first bishop of the Jerusalem church, and “decider” of the Jerusalem council. The consensus is that the letter represents legitimate teachings of James, one way or the other. Rather than questions of provenance, it is a question of theology that has prompted the most heated critiques. The book is too focused on morals–it’s legalistic, moralistic, focusses on works! It doesn’t mention Jesus enough! As is often the case, I think those books or pages that we would most like to see torn out of the Bible–the passages we’d most like to see redacted with black ink like some top secret document–are often the very ones that we ought to spend some time in reflection about. I have some of those passages myself. Nothing in James is among them. If it’s appropriate to use such language about books of the Bible or biblical authors, when it comes to the Epistle of James, I’m a fan. Maybe it has something to do with the fact that, at least as I’ve read, the epistle echoes the words and teachings of Jesus more than any non-gospel text in the New Testament. In any case, I think it’s a beautiful letter. And one that seems to have been composed for the benefit of the whole church–perhaps to help prepare people for baptism. “Father of Lights” is a poetic reference to God with an interesting history. It’s attested outside the canon of scripture in a book called The Apocalypse of Moses. This demonstrates that James wasn’t manufacturing a poetic image to refer to God, but was rather using a term that the recipients of his letter, or those he was speaking to would likely have understood. The description bears some unpacking. This poetic imagery undergirds and supports the insight that every good thing has its beginning and origin in God–everything, including the good that we do. The fact that this is a foundational premise of James’ entire letter puts paid to the idea that the letter forwards some sort of works righteousness. Instead, the letter is a reflection on how we can engage in those works through the power of God in us. James does want us to understand that a lack of those good things and good works–is indeed indicative of problems we need to be aware of. It’s indicative of the fact that we’ve forgotten who we are and whose we are, and that we might be depending upon ourselves rather than on God. James does indeed say–as we will hear next week–that faith without works is dead, but it’s dead insofar as we have not experienced the life that God gives us in Christ. Consider, James begins by telling us that all good things find their beginning and origin in God, and then moves directly into talking about how this connects with our lives of faith. “In fulfillment of his own purpose he gave us birth by the word of truth, so that we would become a kind of first fruits of his creatures” (James 1:18). 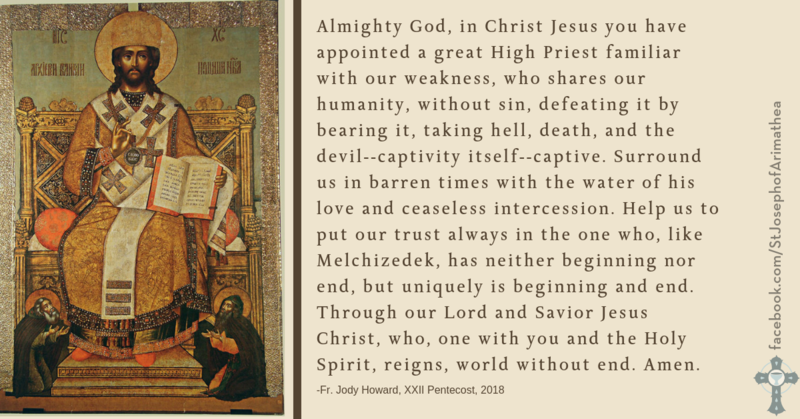 This passage leads some scholars to propose that the letter may have been composed as part of an effort at catechizing people, with this section highlighting the effects of Baptism. God has given us new birth by the word, by the waters of baptism, by the gospel. And just as God enlivened the first creation by the Word, so too we are new creations by the Word. If we’ve been made new and–to quote Paul who is unfortunately and inappropriately held up as a counter example to James–it is no longer we who live, but Christ who lives in us, that new life will bear fruit, both individually and corporately. 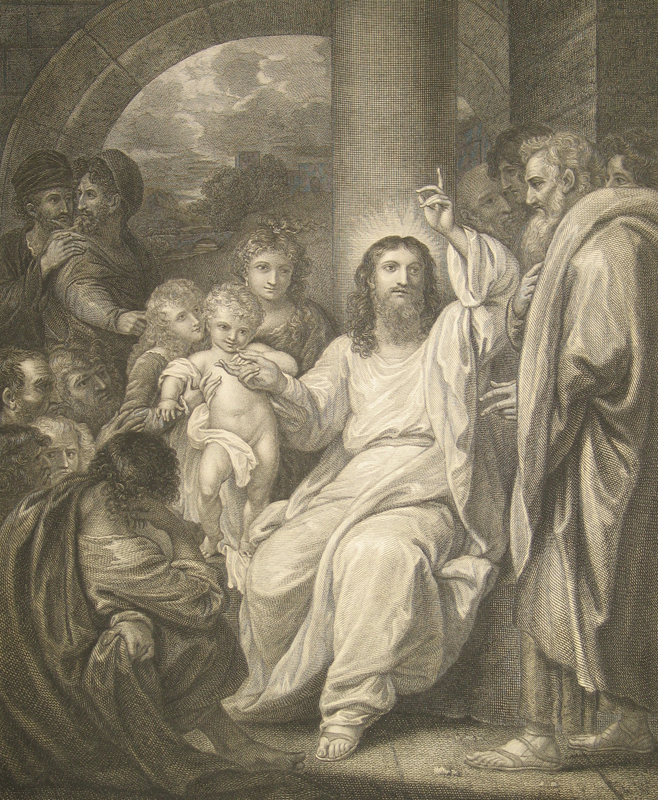 It is from this fundamental stance of God’s gifts and graces that James moves into the expectations for those who would follow Jesus: “You must understand this, my beloved: let everyone be quick to listen, slow to speak, slow to anger; for your anger does not produce God’s righteousness” (James 1:19-20). Our anger–like any work motivated or empowered only from ourselves–cannot produce the righteousness of God, because everything that is good comes from God. So, when James writes that in order to be faithful, we must rid ourselves “of all sordidness and rank growth of wickedness,” he recognizes that there is only one means by which we can accomplish this, by welcoming “with meekness the implanted word that has the power to save [our] souls” (James 1:21). I hope that by now you can see that, while James may not write Jesus’ name all that often in his letter to the Church, Jesus is all over what he’s writing. Christ the Word is fundamental to and presumed by everything that James is telling us. Because of this, when James writes “be doers of the word, and not merely hearers who deceive themselves,” the actions he’s describing are actions that have their origin in the Word of God, which are empowered by the Word in us. We’re utterly dependent. “For if any are hearers of the word and not doers, they are like those who look at themselves in a mirror; for they look at themselves and, on going away, immediately forget what they were like” (James 1:23-24). When we forget who we are and whose we are, when we turn away from the one who is reshaping us in his image, then it’s like looking in a mirror and not recognizing ourselves. We’ve forgotten something fundamental to who we are: that we belong to God and Christ dwells within us. To counter this, when we struggle with intellectual assent to the faith, or emotional excitement about our faith, we can instead look into “the perfect law, the law of liberty,” and imitate the actions of Christ in his earthly ministry, and in being reminded what and who we ought to look like, we can find the strength to “persevere, being not hearers who forget but doers who act” and we “will be blessed in their doing” (James 1:25). Finally, James closes this section of his letter with a clear example of what being a doer rather than simply a hearer would look like, writing that “Religion that is pure and undefiled before God, the Father, is this: to care for orphans and widows in their distress, and to keep oneself unstained by the world” (James 1:27). 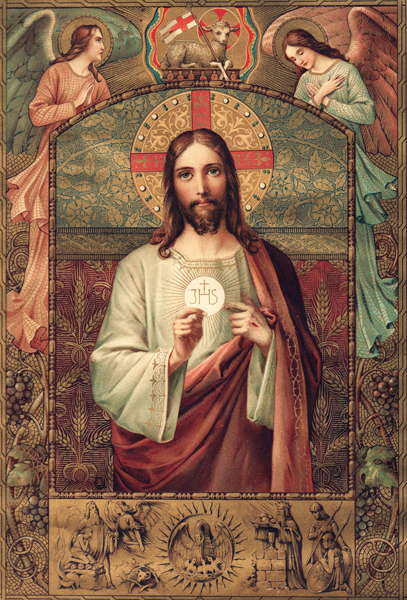 Briefly, imitate Jesus as best you can, and trust in God to do the rest. We know that we would not long be able to carry on with such imitation on our own power. And I believe James knew this. I believe he never expected that we would be carrying on under our own power, because every good thing is from God, and while we might vary and change, while our faith may wax and wane, God’s faith in us never does–for in him there is no variation or variation due to change. Graft in our hearts the love of your Name; increase in us true religion; nourish us with all goodness; and bring forth in us the fruit of good works; and with James, the Brother of the Lord, we pray this knowing that it can only come through Jesus Christ our Lord, who lives and reigns with you and the Holy Spirit, one God for ever and ever. Amen. “Jesus knew from the first who were the ones that did not believe, and who was the one that would betray him” (John 6:64). The Sermon begins at 4:30. Below are my sermon notes for Sunday, August 26, 2018. This is a rare occasion where I typed out the full manuscript. Often I hand write it in my notebook, and then pull only the relevant quotes (if I quote anyone verbatim), and include them with an outline. You can see the way that this sermon both differs in some of its details from the sermon I preached, but how it also displays the same structure and primary content. Jesus knew from the first, who were the ones that did not believe, and yet he taught them and worked miracles among them. Some commentators indicate that the Gospel of John is talking about the crowds here, or the larger group of disciples, and not the twelve, and yet, we know from Mathew’s Gospel, during even the post resurrection appearances, they worshipped him, “but some doubted.” Even if this specific reference in John is talking only about the people in the crowds who did not believe, and not the disciples themselves, but we know that the disciples sometimes wavered in their faith. More dramatically, even if the Gospel is not including any of the disciples among those who did not believe, we know beyond a doubt that Jesus knew that Judas, one of the twelve, was going to betray him. This reality hit me squarely between the eyes a few years ago when I first read a book entitled A Brutal Unity by Episcopalian theologian Ephraim Radner. Radner emphasizes the nature of the church and issues related to church division in his work, and he’s been pretty influential on my own thinking about Christian division. But this section is about more than the formal divisions between churches–the official and sometimes white washed theological arguments and sometimes fossilized practices and habits that keep us apart. This is about something deeper: a choice that Jesus makes early in his ministry with knowledge about the evil in the heart of one of the disciples, and yet he embraces him as one of his inner circle anyway. A central question involves the fact that Jesus “chose” Judas as one of the Twelve (Luke 6:13-16; John 6:70-71; Luke 22:3, 47; Acts 1:16-17). Jesus chose the one he “knew” would betray him yet placed him among the Twelve around whom the heavenly Jerusalem would be built (Rev 21:14), though, of course, his place would be taken by another. The issues of predestination and foreknowledge—as Augustine and Calvin and Barth all understood—were implicated in this fact. But just as importantly, and because of this, comes the issue of Jesus’ own willingness, in all deliberation, to take to himself one whom he understood to be bound to “Satan” in some fashion (and even Peter too had this about him), that is, to be his “enemy” (cf. Luke 22:13). 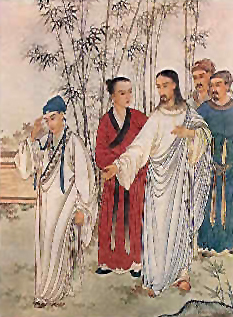 Thus, the notion, driven by readings from the alternative traditions about Judas recently made popular, that there was a “secret” pact between Jesus and Judas, in which Jesus himself orchestrates his own arrest with his friend’s cooperation, have no foundation in the Gospels themselves—Jesus did not make an agreement with Satan as his ally! But there is an unsettling and perplexing problem at work, nonetheless, in how Jesus could tolerate and even embrace one whom he could not trust because of the latter’s certain and ultimately immovable opposition. How many of us could, or would even consider, embracing someone as a friend whom we knew would betray us? Who could even lead us into a situation that would result in our death? And yet this is exactly what Jesus does. Radner points out, in fact, that Judas isn’t the only one “bound to Satan” in some way, but Peter is too (remember, Jesus actually refers to Peter as Satan when he opposes what must come to pass). It may seem extreme to talk this way about Peter, but I think it is revealing not only about Peter and Judas, but all the disciples: that Christ had perfect knowledge of what was to come, does not mean that every one of the disciples wasn’t equally capable of such betrayal. Indeed, Jesus’ own actions demonstrate a sense in which everything is not determined, as he tells Peter after predicting his three denials, “…I have prayed for you that your own faith may not fail; and you, when once you have turned back, strengthen your brothers” (Luke 22:32). In some sense two paths are held out before us. Two examples. 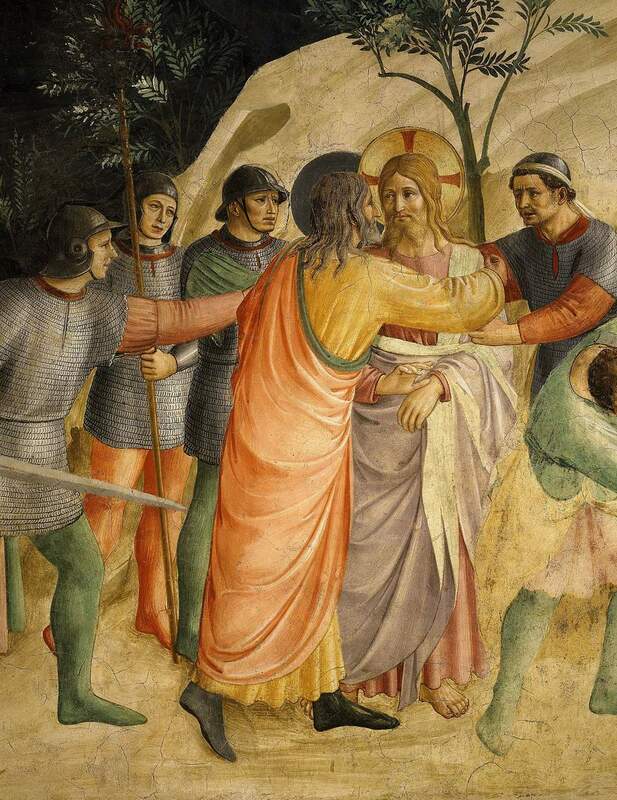 The path of Peter, which leads to redemption out of failure and betrayal–we could call this the path of hope–and the path of Judas, which can admit no opportunity for redemption, for forgiveness. We could call this this path of despair. But if Judas despaired and lacked both belief and hope, had he always lacked them? Was Judas always wicked? This is a contested question in the church of the first four centuries. Some, like Augustine, will say that Judas was always wicked and bound for destruction. Others, like Origen and–perhaps–John Chrysostom, argue that there are turning points at which Judas chooses the evil over the good. So Judas’ apostleship was legitimate and true, and he was faithful–except when he wasn’t. And isn’t this like so many of us? And Jesus knew who would betray him, and yet he gave Judas a chance. The how of this is a mystery–we could go far into the weeds about what God’s foreknowledge means for human choice and freedom, and we could likewise discuss the different ideas about what exactly Jesus’ foreknowledge means, that is, how his divinity interacts with the limits of his humanity–but we’ll leave those for another time. The key for us today is that Jesus knew, and yet he still put it all in Judas’ hands. He somehow had hope for Judas, and called him anyway, knowing how he would fail. And this is good news for us. Because each of us fail. 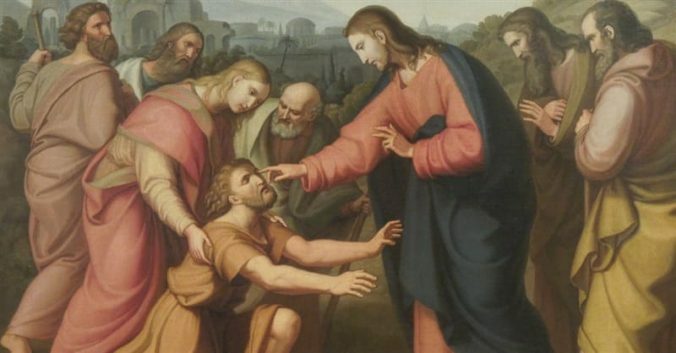 Each of us, if we’re honest, could see ourselves in this passage from John: “Jesus knew from the first who were the ones that did not believe, and who was the one that would betray him” (John 6:64). Who among us has never doubted? Who has never struggled with disbelief? Who has never betrayed their core convictions, their better angels–who has not at some point looked around to find themselves a betrayer of Jesus, dead in their sin? And yet, Jesus did not simply choose Peter who would come to repent and return, or Judas who would betray him and see no room for reconciliation or restoration, Jesus chose you and me. Jesus has hope for us. Jesus gives us the space we need. And what we do with it, is on us, but not on us alone. Jesus isn’t going to force us, but God’s grace in Jesus Christ is with us every step of the way. That’s part of what it means to abide in Jesus’ love. It means to experience the grace of God and to therefore await with hope and eager longing for the fulfillment of God’s will in our own lives, and in the life of the world. The mystery in all of this is that Jesus embraced people he knew would disbelieve him, question him, and even betray him. He embraced them, empowered them, taught them, and made them part of his ministry and his body. And this is good news for us, because God does the same thing for us in Christ. In last week’s sermon I emphasized the importance that we never put our ultimate trust or faith in any human or human institution, including the Church, but only in God, only in Jesus Christ. If that sermon seemed a bit dark to some, this is the counterpart to it. Counterpart, but not counterpoint. They aren’t contradictory, though we would like to make them so. The reality is that our call to follow Jesus is risky. We are called to Love God and love our neighbor. That is Jesus’ summary of all the law and the prophets. That’s risky business that we’ve been commanded to take part in. Loving God can be risky–we never know what God is going to call us to do after all–but the riskiest thing about loving God is the call to love our neighbors. Loving other people is dangerous. Trusting other people can set us up for disappointment. This is one of the core places, I believe, where we have to embody Jesus’ admonition to be as wise as serpents and as innocent as doves. We never lose sight of our own sinfulness, our own capacity for evil. And we all have it. The sin that temps me may not be the sin that temps you, but we are all tempted to sin, and from time to time–perhaps from time to time to time–we succumb to temptation. Usually, if we’re honest, those sins have hurt someone, or would if they knew. Being humble and keeping in mind our own propensity to sin, can help us relinquish judgement we might hold over other people, but it will also keep us mindful that indeed, Jesus is the one in whom we’re to trust. That the Church has to establish safeguards, and we would be wise to as individuals as well. And yet. It’s risky, because we’re called to hope in other people whom we know to be sinful, whom we know to be broken, whom we know to be apt to wound us if we love them. And we’re nonetheless commanded to love them. There’s only one way we can ever hope to accomplish this–to hold on to the reality of our own sin and the sinfulness of others, while simultaneously extending to them the same benefit of the doubt, the same grace that God has extended to us–and here we work back to the beginning of our gospel text–the only way we can do this is by abiding in Christ. 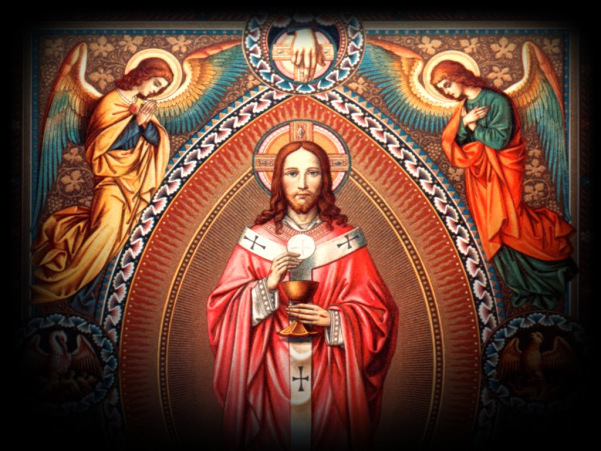 By putting our faith and trust and hope in Jesus, and by receiving again and again the grace of God in the sacrament of Christ’s body and blood, by hearing over and over again the word of God that inspires us, and calls us to faithfulness. I love the word abide. It can simply mean to dwell, or it can mean to patiently endure, ore it can mean to await with anticipation. When we abide in Christ, there are going to be things that we can only patiently endure. We re going to await the coming of Christ with holy anticipation. This is what we’re called to, for Christ to dwell in us and we in him. This is what empowers us to take the risks we need to take on each other as Christian. Even though Jesus knows perfectly, he withholds judgement and gives all the disciples–even Peter and even Judas–an opportunity to walk faithfully and to do good. If God, who knows perfectly what is in all hearts, provides such space, how much more should we who judge only in our limited capacities, by what our eyes see or our ears hear, provide such space to each other? But we can only find the strength and the means to do this, to take such a risk on each other, and for our own growth in faithfulness, by abiding in Christ, and through Christ abiding in us. Amen.